Lush greenery softens the edges of Atlanta when viewing the city from a plane, from the upper floors of its many new high-rises, and even on the big screen in the many films for which Atlanta serves as the backdrop. On the ground, the reality of Atlanta’s unbounded development comes sharply into focus. Clogged highways, suburban sprawl, and explosive growth (Atlanta saw the third highest population gain of any metro area in the country between 2016 and 2017, according to the U.S. Census Bureau) threaten the city’s famous tree canopy. In fact, a new study found that Georgia was among five states to experience the greatest loss of urban tree cover over the past five years. The study concluded that U.S. metropolitan areas are losing about 36 million trees every year (roughly 175,000 acres of tree cover). Lead author David Nowak of the U.S. Forest Service values the total loss of benefits from having trees at roughly $96 million. These losses include the ability to remove air pollution, sequester carbon, and conserve energy. Recognizing the importance of such greenspaces, the City of Atlanta hired researchers at Georgia Tech to assess the urban tree canopy to provide a baseline for planning and development moving forward. According to their count, almost 48 percent of Atlanta was covered by trees in 2008. 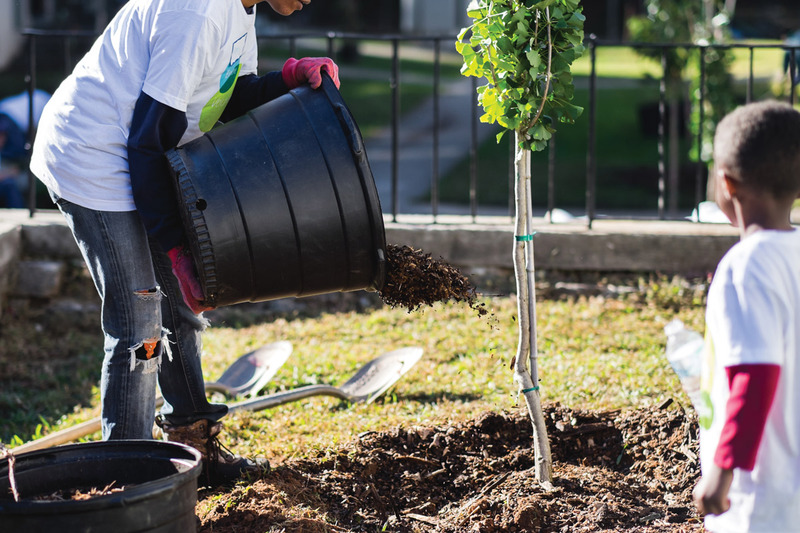 Under former Atlanta Mayor Kasim Reed, the city set a goal to restore its tree canopy to 50 percent or greater and enlisted the help of nonprofits. But since then, the economy has rebounded and development has resumed at a breakneck pace. Gwinnett, Fulton, and Cobb are three of the top 10 counties in the South experiencing tree loss due to development, according to Trees Atlanta. “Atlanta is called the ‘City in the Forest.’ We have a beautiful, diverse urban forest, which is unique, and we need to do everything we can to protect it,” says Greg Levine, co-executive director and chief program officer of Trees Atlanta. Despite its many education initiatives, Trees Atlanta struggles to raise awareness. That’s why Levine is excited about the Atlanta BeltLine Arboretum. A partnership between Trees Atlanta and the BeltLine, the Arboretum will evolve into a 22-mile horticultural tour of neighborhoods. Volunteer docents have already started leading free walking tours from Inman Park along the Eastside Trail. With its focus on sustainability, the BeltLine has drawn attention to parks and greenspaces. At the same time, developers are eyeing the 45 intown neighborhoods the BeltLine will connect. In one such neighborhood, Ormewood Park, residents have recognized that tension. On land once called Mansour Farm between E. Confederate Avenue and Walker Avenue, the Tapestry Community Homeowners Association has stewarded seven acres of greenspace ever since a developer deeded it to them for a dollar in the late 1980s. Longtime resident Julie Lowring recalls the homeowners’ original intent for the land: to provide a safe space for the neighborhood kids to play. “All those kids grew up, moved on, had their own,” she says. After a city stormwater sewer separation project in 2005–2007 tore up the property, the homeowners banded together again to determine the fate of their shared land. With development threatening the mature hardwoods and intermittent stream, the residents began a restoration project. They partnered with Trees Atlanta to design a plan. They removed invasive plants and planted 150 trees. With a grant from the Five Star and Urban Waters Restoration Program, they installed a native meadow and restored stream buffers, where they now perform water testing through the City’s Adopt-A-Stream Program. They invited the Atlanta Community Food Bank to plant vegetables on an acre free of charge. Farmer Fred Conrad, who works for the food bank, harvests produce that goes to Georgia’s WIC Program. In the summer of 2014, a pair of beavers moved in. “It’s been a challenge to figure out how to coexist, but we want them here. They’ve brought a whole new ecosystem,” says Lowring. Snowy egrets, herons, Canada geese, ducks, turtles, and frogs have also found homes in the wetlands and streams of Tapestry Gardens, which are open to the public. A Trees Atlanta Youth Tree Team recently planted two butterfly gardens to complement the six beehives on the property. Jones runs Southeastern Trust for Parks and Land in Atlanta. He launched the nonprofit in 2012 to preserve undeveloped land and make it available for public recreation, which in turn leads to economic and community development. A spur line from the BeltLine will lead the public to Tapestry Gardens, where Lowring hopes future generations will reconnect with nature. Similar stories are playing out across the city. In Buckhead, a retired art teacher grew concerned about diminishing greenspace. Working with developers, she convinced them to preserve 30 acres of wetlands, which became the Blue Heron Nature Preserve. “We want to carve out a parcel where we can work in harmony with each other and support what naturally grows here. We are a living example that it can be done,” says Miranda Swaim, communications coordinator. The nonprofit that stewards the preserve recently launched its first-ever capital campaign to raise $750,000 for the Blueway Trail Initiative to connect to Buckhead’s Path400, which should allow more people to enjoy what has become an urban ecology center. Park Pride works with communities in Fulton and DeKalb counties to build and improve parks. The nonprofit organization has given more than $5.8 million with matching grants to projects since 1989. One of its most recent grant recipients broke ground in 2018 on a pocket park in Fulton’s Lindridge Martin Manor neighborhood, which had no greenspace or playgrounds. When complete, Armand Park will become a trailhead of the South Fork Peachtree Creek Trail system, which is maintained by the South Fork Conservancy. After the City of Atlanta acquired a vacant home in a flood zone and demolished it, the neighborhood helped decide the property’s future, explains Lindridge Martin Manor resident Jennifer West, a real estate lawyer. The Lindridge Martin Manor Neighborhood Association worked with the Department of Parks and Recreation and the South Fork Conservancy to create a master concept plan for Armand Park. They started fundraising to raise the 50 percent community match required for the Park Pride grant application. They even invited children to draw pictures of their dream playground to enter in the Armand Park Drawing Contest, and based on the children’s pictures, Friends of Armand Park tailored its original vision to include playground equipment. “It’s brought the neighborhood together,” says West. “We’re all rallying around this project.” The residents raised the money they needed to secure a $200,000 grant from Park Pride last December. This fall, Armand Park is set to be complete. “There’s no way our neighborhood could have ever made this park a reality without them,” says West. Protecting greenspaces with creeks is especially important for preserving tree canopy. Stacy Funderburke, assistant regional counsel and conservation acquisition associate with The Conservation Fund, a Virginia-based nonprofit, works with the City of Atlanta to identify parks that are suitable for protecting canopy. It receives requests from communities and then buys land for the City. 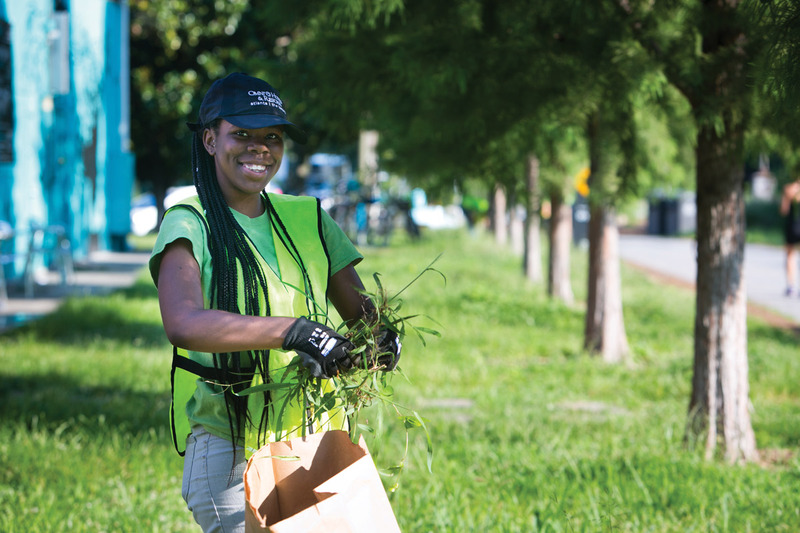 With a $2 million revolving fund established by the Arthur M. Blank Family Foundation, The Conservation Fund has acquired around $23 million in parks and greenspaces in the city; that’s between 40 and 50 projects. For example, The Conservation Fund has transformed vacant and blighted lots into greenspace for the English Avenue and Vine City communities where neighborhood kids now play together. The Conservation Fund teamed up with Georgia Conservancy, The Nature Conservancy, and Trees Atlanta to form the Atlanta Canopy Alliance. 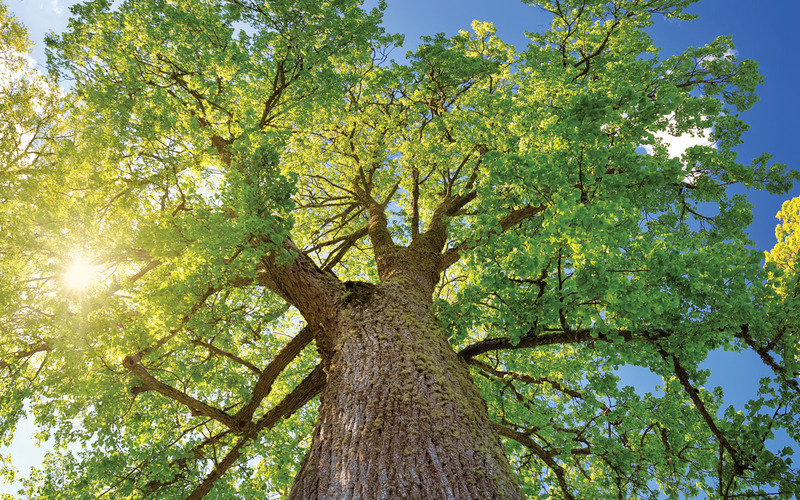 They won big in 2016, when the Atlanta City Council unanimously voted to change the tree ordinance, allowing tree recompense funds to be used to buy pieces of forested property. “If we want a city in the forest, we have to protect the forests that exist in the city, and there are still some older-growth, amazing forests intact in the city,” says Funderburke. Another potential policy change conservationists are excited about is the Georgia Outdoor Stewardship Act (HB 332). If voters support the bill in November, the State will be able to use recreation taxes to buy greenspace. That will mean $20 million to $25 million of dedicated funding for the next 10 years, says Funderburke. Atlanta’s Department of City Planning is currently assessing canopy, watershed, and existing greenspaces to help develop the Urban Ecology Framework. That framework will likely result in more policy changes, which Funderburke and Levine argue are necessary for protecting canopy. Georgia cities lost 19,000 acres of tree coverage between 2009 and 2014. U.S. urban areas lose approximately 36 million trees per year; that’s 208 Central Parks. The value of this loss is about $96 million per year in benefits. Percentage-wise, the states that experienced the greatest loss of trees between 2009 and 2014 were Rhode Island, Georgia, Alabama, and Nebraska. Atlanta has had one of the nation’s lowest percentages of park space per capita. That ranking is improving, however. Currently 5.9 percent of the city’s land is park land.